Are You an Expat Interested in Publishing Your Story? Last week, I had the pleasure of joining the award-winning poet Jessica Goodfellow at the Japan Writers Conference 2015 to discuss writing and publishing as an expat, comparing my experience publishing with a Big Five press versus hers bringing out books with various small and indie presses. We talked about what we learned from our own recent book publication journeys, covering ways of making necessary industry contacts (including agents and publishers), connecting with potential readers, types of publishing models prevalent in different genres, and more. One other topic we discussed: the importance of supporting other writers, especially as an expat. In the spirit of this camaraderie, please feel free to get in touch if you’re interested in our list of almost 100 resources and tips that we handed out about increasing your chances of getting noticed by presses big and small. There’s a private, protected form you can use to contact me here, and I’ll be happy to send them along. 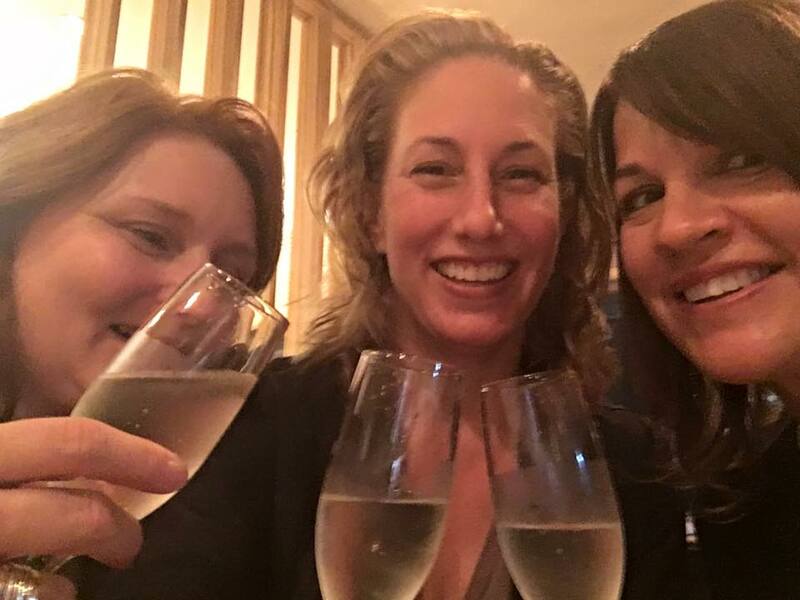 Oh, and also in the spirit of expat camaraderie, here’s a picture of me, Jessica, and our lovely friend Lisa (both of whom make repeated cameos in The Good Shufu, by the way!) sharing some bubbles post-conference. Being a gaijin wife in Osaka, I can be pretty out of it. I’d never heard of “The Next Big Thing,” or even knew what a “blog meme” was, until the lovely Jocelyn Eikenburg set me straight. She’s the author of the forthcoming book Red All Over, a memoir of finding love and home in China; about, as she has written, “what happens when you let go of every expectation you had about life, love and even your own wedding, and just learn to listen to your heart and say ‘I do’ to the people, places and possibilities that really matter.” Jocelyn has been one of the most enthusiastic and supportive friends and fellow writers I’ve met online since my unexpected book deal landed in my lap! She’s also a smart and funny and a beautiful writer, and if you don’t know about her and her blog Speaking of China, then you are missing out. Well, the basic idea came from my falling madly in love with the least likely person in the world: a Japanese salaryman who could barely speak English (and I spoke no Japanese). The book is about what happens when you are a Boston-based, skeptical, plan-obsessed, feminist literary academic who meets the love of your life, but being together means you must give up every plan or goal you’ve ever had and essentially forfeit your own world for his. Really??? I need to finish writing the book first before I can even start to think about this one. Now, if you’re asking what I’d want to wear on the red carpet, that’s another story. But don’t get me started, or I may just stop writing and click over to some online shopping sites, just to see what they…. The Good Shufu a true story about finding love, meaning, hope, and self in the least likely places in the world: the places we always swore we’d never go. The Good Shufu is forthcoming from Penguin’s Putnam imprint in 2015. It’s represented by the very, very wonderful Rachel Sussman of Chalberg & Sussuman. And I’m still in shock and awe over all of this! Oooh, check back in, let’s say, 7 months? The full draft is due to my editor at Putnam, the incredible Sara Minnich, in January 2014. I started writing the book at the tail end of 4+ brutal years of fertility treatments and 2 pretty heart-rending pregnancy losses, all undergone in Japan (and I still speak virtually no Japanese). I hadn’t written anything—I mean anything—in a few years because of the stress of this medical issue. And then one day, just off the cuff, I sent a pitch to the editor of the New York Times Motherlode blog about the difference between the desire to have a biological child and the desire to be a parent. She published the piece (although with a much different title than the one I had chosen), and a few days later, an editor at Putnam emailed me and asked if I’d be interested in submitting a memoir proposal. I was shocked! And delighted! And still totally infertile! So while all I wanted to do was crawl under the covers and hide from the world and my twice-daily-in-the-stomach-blood-thinner shots that my clinic in Osaka thought I needed to have any chance of sustaining a pregnancy, I signed up for a course on nonfiction proposal writing through MediaBistro, wrote a proposal and four sample chapters, submitted it to Putnam, and they offered me a deal! I was shocked! And delighted! And still totally infertile! But working on this book has been one kind of godsend, because it has helped me cope with coming to terms with turning 45 and abandoning our medical quest to try to have a child—an issue I write about towards the end of the memoir. So, despite some of the sadness of the past few years, how can I not feel like the luckiest girl in the world? Now, I’m excited to introduce Kaitlin Solimine, another recent friend and fellow writer whom I’m honored to follow and know! She’s an award-winning writer about China, a former U.S. Department of State Fulbright Creative Arts Fellow, and the 2010 Donald E. Axinn Scholar in Fiction at the Bread Loaf Writers’ Conference. Most recently, she was the March 2012 guest editor for the magazine Cha: An Asian Literary Journal , and I got to hear her give an incredible reading from her forthcoming novel at the Four Stories Boston 2013 opening night, an MP3 of which is posted here. Rumor has it, she attracted some publishing interest at this event, which doesn’t surprise me one bit! In the comments to my post here, about how I actually got my book deal, Philomela asked how I ended up getting in touch with the Motherlode editor at the New York Times, KJ Dell’Antonia (who’s great). Here’s the story (with a rather long intro, which I explain at the end)! Honestly, I hadn’t written anything for almost a year, given the rigorous treatments I was undergoing, the stress of the 2 miscarriages, not being able to travel back home to the US b/c of it all, the month after month of being crushed, etc., etc. I felt like I had no energy to do anything but just get up, go to the clinic almost daily (in Japan, most clinics don’t allow women to give themselves the hormone shots, so I had to go in for my daily shots), keep writing for my regular part-time freelance job (I write content and overviews about faculty research for US universities) and function, at least externally, like a relatively normal person. I felt awful about it, like I was going to go through me early 40s with nothing to show for it but a bunch of failures and heartbreaks, and no career or writing advancement at all. But one night, on one of the infertility forums I used, I saw a post mentioning a previous Motherlode column (which I mention in my pitch below), and it gave me an idea for a pitch. So I sat down and tried to start a brief pitch, and the whole thing just came rolling out of, and I sent it that night, and KJ kindly responded right away saying she really liked the idea and wanted to post my piece. And the process (the piece being posted on the NYT site, the Putnam editor reading it and getting in touch, etc.) just rolled on from there, taking me totally by surprise. Once I had some sense that at least a few people might be interested in what I had to say, it became much easier to write (although it was still hard while I was going through treatments, but at least it was now manageable). It was just too much, though, to write into the vacuum of not-knowing-if-anyone-would-read-it, while I was dealing with the alienation of 4 years of trying, and failing, to get pregnant. Anyway, I belabor this point a bit because as a writer I’ve heard a lot of people say that what makes a writer a real writer is that they just write, no matter what–they just keep going. And that just hasn’t always worked for me. Maybe I’m not a real writer; maybe I’m just someone with something to say who managed to interest an editor at Putnam and hopefully will interest a few more readers. But either way, I’d like to reassure people that sometimes (or at least this time), it’s not only the people who manage to write faithfully every day who get a book deal. Sometimes (or at least this time), it’s the people (or person) who fails miserably at that but who still has moments where they (or she) pulls through and it ends up working. For me, they key was to never give up completely, but to recognize that sometimes, with writing, things move or succeed when you least expect them to, and go nowhere when you most feel like they should be moving. Subject line: Motherlode pitch – Closed to Adoption: A Moral Failure? I know from reading your Motherlode posts that adoption is an issue close to your heart and that you are interested in blended families. Ours is culturally blended—in more ways than one: liberal American Jewish writer (me), and traditional Japanese salary-man (my husband). I was originally open to adoption and my husband, in whose culture adoption is extremely rare, never has been. Now, as we near the end of 4 years IVF and other fertility treatments (all done in Japan, where we live, and where I don’t speak the language…stories for another time) and my 44th year, we are preparing to move on and live childless. I’ve accepted, without even too much of a fight, my husband’s feelings that adoption just isn’t for him. But my willingness to accept this—to prioritize my marriage and being a wife over the possibility of being a mother, to admit that I also to a great degree feel a much stronger urge to have our biological child than to have a child at all—makes me call into question a whole range of issues. Chief among them is: Am I less entitled to mourn not having a child if I am not willing to do anything it takes to become a parent? Is it some sort of moral failure to long for a biological child but not an adopted one? At 444 comments, her piece—and this statement in particular—was one of the most hotly-debated posts on the blog. Would you be interested in a post written by me that explores this issue more fully?